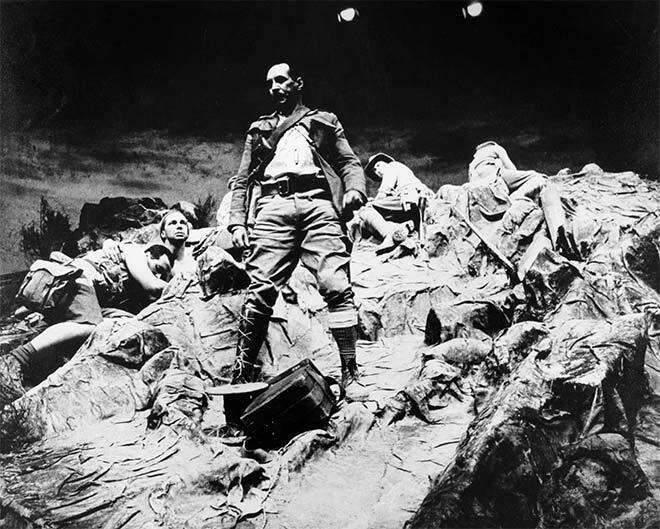 This photograph from Maurice Shadbolt's play Once on Chunuk Bair shows its first production, at Auckland's Mercury Theatre in 1982. The action takes place between dawn and dusk on 8 August 1915, the day New Zealand soldiers took the hill of Chunuk Bair on the Gallipoli peninsula in Turkey during the First World War, suffering savage losses in the process. Shadbolt questions the wisdom of New Zealand participation in a remote European conflict, and undercuts the myth of the heroic Anzac soldier. A filmed version of the play appeared in 1991.